Hand Anatomy - want to learn more about it? The human hand, the most distal part of the upper limb, is a remarkable feat of engineering and evolution. It is strong enough to allow climbers to tackle any mountain, but also sufficiently precise for the manipulation of some of the world’s smallest objects and the performance of complex actions. The hand itself consists of specific bones onto which various muscles are attached, and a collection of neurovascular structures responsible for drainage and innervation. However, the intrinsic muscles of the hand are only partially responsible for all its range of motion. The other major contributors are actually the forearm muscles, which project tendons towards the hand via an equally complex and flexible anatomical structure, called the wrist. A solid understanding of the hand requires good grasp (pun intended) of its entire anatomy, so in this page we will look at all of the above structures. Watch the following videos to find out everything about all the bones of the hand. Each group of hand bones is important in its own right, but the eight carpals are especially interesting because they are arranged in two distinct rows and are direct contributors to the formation of the wrist. We’ll come back to the wrist later on. In the meantime, it would be beneficial for you to complete the following carpal bones quiz because they are the most difficult hand bones to get your head around. The thenar muscles are four in total; they are evident and easy to palpate on the radial side of the palmar surface of the hand, at the base of the thumb. They form the ‘ball’ or ‘fleshy’ part of the thumb known as the thenar eminence, and are named as follows: abductor pollicis brevis, adductor pollicis, flexor pollicis brevis, and opponens pollicis. The thenar muscles are capable of various thumb movements; abduction, adduction, flexion, and opposition. Watch the following video to learn more about the thenar muscles. Also on the palmar surface of the hand, the thenar eminence has a corresponding, ‘fleshy’ region on the ulnar side of the hand. It is easily palpated and visible at the base of the little finger. This region is called the hypothenar eminence and consists of the four hypothenar muscles: abductor digiti minimi, flexor digiti minimi, opponens digiti minimi, and palmaris brevis. This group of muscles are expert movers of the little finger (fifth digit); they abduct, flex, and bring it towards the thumb to facilitate opposition. 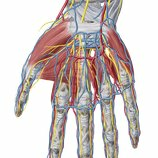 The nerves innervating the muscles of the hand originate higher up, from a structure called the brachial plexus. This plexus is formed from the combination of the anterior branches of the 5th to 8th cervical spinal nerves and the first thoracic one. The important nerves travelling towards the hand from the brachial plexus are the median, ulnar, and radial nerves. When referring to the hand, the radial nerve only provides cutaneous innervation along the outside of the thumb. In contrast, the other two nerves supply the hand muscles; the median nerve predominantly supplies the thenar muscles, while the ulnar nerve mainly innervates the hypothenar and other intrinsic muscles of the hand. The main branches projecting onto the hand muscles are from the median and ulnar nerves. The following video and articles will explain everything you need to know about the innervation of the hand, as well as its origins. Since the hand is the terminal region of the upper extremity numerous anastomoses take place here, resulting in quite a complex vascular network. All the hand arteries originate from two main, larger ones; the radial and ulnar arteries. These two blood vessels travel down the radial and ulnar sides of the forearm, respectively. Understanding all the above arterial arches and anastomoses is easiest through a visual approach, therefore the video given below will clarify the entire neurovasculature of the hand. The veins are very similar to the arteries, so if you understand the latter then the drainage pattern of the hand will be a piece of cake. Watch the video mentioned above to learn all about the hand veins. The anatomy of the hand is incomplete without understanding the wrist. This complex structure connects the entire hand to the radius and ulna, facilitates the passage of tendons together with the above mentioned neurovascular structures from the forearm to the hand, and permits us to exploit all its movements. Those are flexion, extension, abduction, and adduction of the hand. This quiz is specially designed to test your knowledge about the hand and wrist. It specifically focuses on bones, muscles (including attachments, innervation, functions), arteries, veins, and nerves. Tackle it to cement and master the anatomy of the hand and wrist! Finally, take the following last quiz, which was created in order to test your knowledge in hand anatomy. It specifically focuses on bones, muscles (including attachments, innervation, functions), arteries, veins, and nerves. Tackle it to cement and master the anatomy of the hand and wrist!